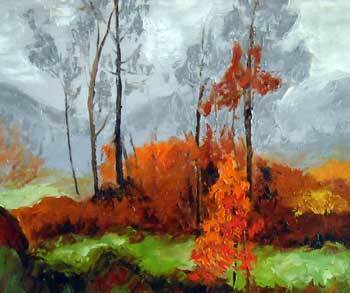 Gertrud Sorensen builds her landscape paintings with a heavy brush and oil paint. She prepares her canvas and heads out into Algonquin Park to find a spot that speaks to her. She sets up her easel and begins to create a feeling of solid groundedness. Her style of painting is reflective of the sense of permanence she feels living upon the solid rock that is the Canadian Shield near Algonquin Park. Gertrud grew up in the Tyrolean district of Austria where she spent much of her time in the steadfastness of the Alpine Mountains. Gertrud emigrated to Ontario in her early twenties where she discovered the endless source of inspiration that is the wilderness in the Algonquin region. Gertrud's intention is that her connection to the land transcends the viewer through her paintings.